Our home base to explore two scenic byways through the Mississippi Delta was Mississippi River State Park in Marianna, Arkansas. The large visitor’s center is less than 2 years old and has an excellent interpretive center about the Mississippi Delta area. The staff and rangers were friendly and helped make our stay here memorable. 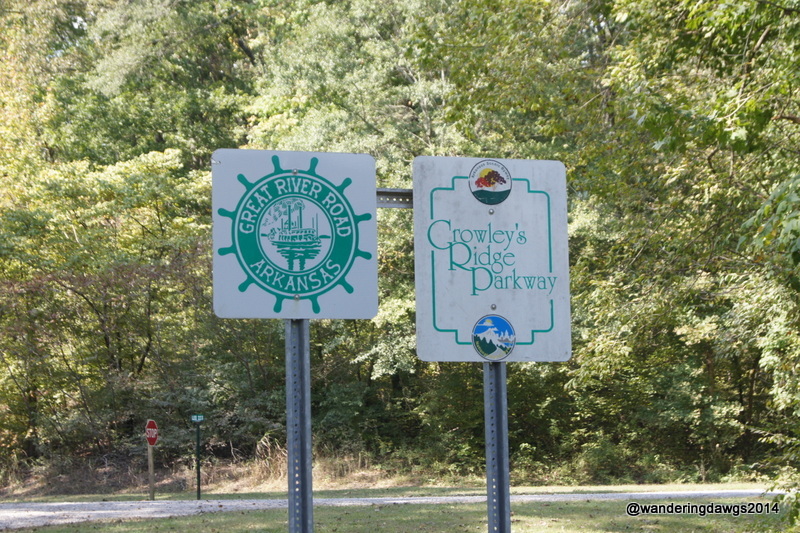 The park is located in the Mississippi Delta on the Crowley’s Ridge Parkway and the Great River Road within the St. Francis National Forest. We stayed in the Beech Point Campground on a peninsula in Bear Creek Lake. It is one of the best state park campgrounds we have ever seen. There are only 17 sites in the campground with 14 full hookup waterfront sites and 3 tent sites. Ours was a large pull through with a big patio area for the picnic table and fire ring. For my review of this campground click here. To ask about exploring the area we talked to Park Ranger John as he was patrolling the campground. After getting directions, we had a plan for the next day. Crowley’s Ridge rises 200 feet above the Mississippi River Delta flood plain and stretches more than 200 miles from just below Cape Giradeau, Missouri to Helana, Arkansas. The Crowley’s Ridge Parkway in Arkansas traverses the entire ridge. The section of the parkway we drove is called the “high road” by the locals. We started our drive to Helena-West Helena on the “high road”. On top of Crowley’s Ridge, the gravel road wound through the St. Francis National Forest. Only a few of the tall oaks, sycamore and buckeye trees had started showing any fall colors. The only other vehicles we saw belonged to hunters. I hope they had better luck with deer than we did. We only saw one all day. Except for a couple of National Forest campgrounds there was no other sign if civilization. After about 20 miles we were back on a paved road and soon were on Cherry Street in Helena-West Helena to visit the Delta Cultural Center. Oh No! Closed on Monday! We felt like the Grizwalds when they got to Wally World to find it closed for repairs! We took the “low road” back to the campground. This gravel section of The Great River Road is just a small part of the 10-state route from Canada to the Gulf of Mexico along both sides of the Mississippi River. 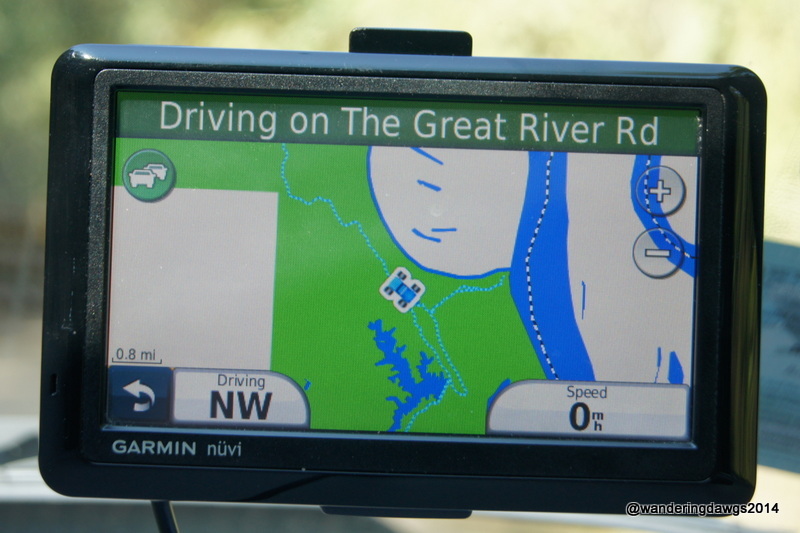 In Arkansas the road rarely goes right beside the river. As we drove along the “low road” we passed through Cypress swamps and took a side trip to the mouth of the St. Francis River where it joins the Mississippi River. With Willow Trees growing along the banks of the river, the mighty Mississippi is about a mile wide in this location. We enjoyed two delicious meals from local restaurants that day. The meals were so memorable I will post about them in a later post. Stay tuned! What a gorgeous site! This is probably one of the nicest I’ve ever seen. Great find! Too bad about the Cultural Center being closed:( But it looked like a beautiful drive. I have added it to my “favorites” list! I wish we could have stayed longer than 2 nights. That lakeside overlook campsite looked very sweet. We are in a lovely little campground in Aiken, S.C. and just finished watching the Georgia/Florida game. OUCH. Snowed this morning in Aiken before we got here. Hope you are somewhere warmer. It’s cold here on the Georgia coast, too! Yes, the game was painful to watch. Glad we were watching from our living room and not in the stands! What a great camp site! I love foggy morning photos. Can’t wait to hear about the meals. Sherry, next time you travel across I-40 it is worth getting off the interstate to go there. Even with only 17 sites it wasn’t full.